The Annual Patsy Cline Birthday Show! 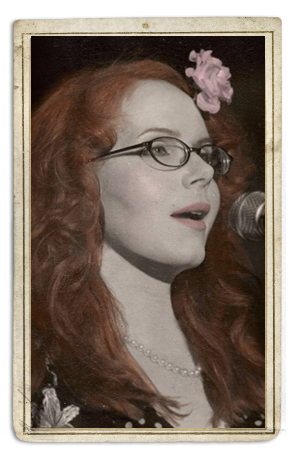 Every year Heather organizes, hosts and performs at this spectacular event celebrating the music of Patsy Cline. 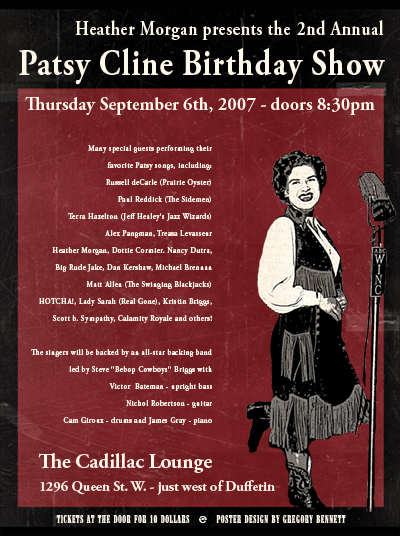 This year's 6th Annual Patsy Cline Birthday Show is not to be missed! It takes place on Thursday Sept 8th at the Lula Lounge in Toronto. The performers will be backed once again by the stellar backing band of Steve 'Bebop Cowboys" Briggs, Dennis Pendrith (Vinyl Cafe) on upright bass, Nichol Robertson on guitar, James Gray (formerly of Blue Rodeo) on piano and Cam Giroux (By Divine Right, Luther Wright) on drums. Tickets available at the door the night of the event. Dinner reservations guarantee seating. The Lula offers an excellent menu prepared by their in-house chef. Also visit the Lula Lounge to make dinner reservations online.